Girl with a Pearl Earring (c. 1665 – 1667) Oil on canvas, 18″ x 15″ (approx.) Artist- Johannes Vermeer. I first came across this image when I had just turned 13 years old, on the back cover of an issue of Reader’s Digest (I don’t know how it is today but in the mid to late nineties, the Indian editions of the magazine always had painting images on their back covers). I was home for my school holidays (from boarding school) and in the afternoons when the household was in siesta mode, I used to go up to this small room on our terrace to search for all the old issues of the magazine, piled up against a wall on a large trunk. The sole purpose of this rummaging was to copy these paintings on small oil/watercolour sheets! 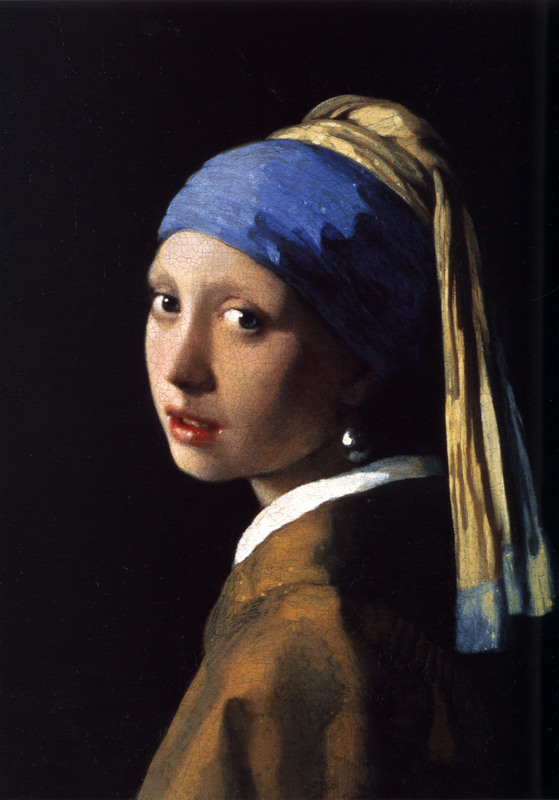 One day, I came across the Girl with a Pearl Earring and I remember that even then with the magazine in my hands, I stared at this painting for a long-long time. There is something so mesmerizing about this work. The innocence, grace and beauty of the girl is captured so well by Vermeer. It’s hard to describe but I feel the painting is so simple and uncomplicated- when you look at it; time stands still, the noises and humdrum of life fade away and you get lost in the painting. Every time I look at this image, it evokes the same undiluted feeling… truly one of Vermeer’s best works. 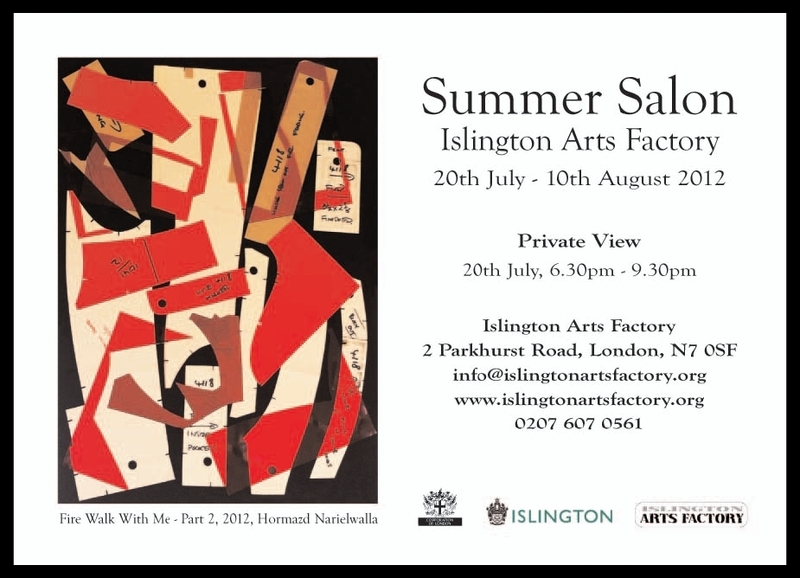 My work is being displayed at the Summer Salon exhibition, Islington Arts Factory. The preview is this friday, 20th July. The exhibition runs till 10th August so, all those who can’t make it for the preview but are genuinely interested in seeing, feeling, experiencing (and much more…) art, please drop by any other day. 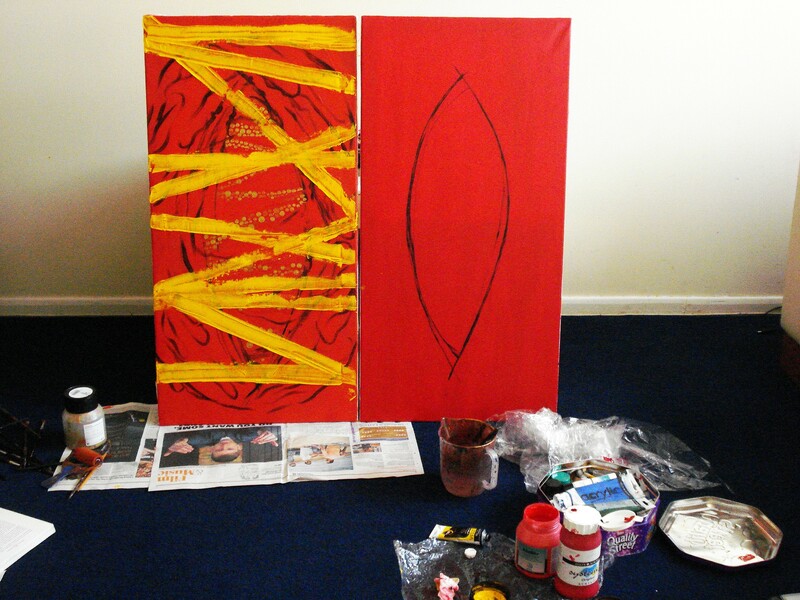 My ambitious little work in progress… currently a diptych but will soon turn into a triptych, hopefully! As of now, the middle panel should be full of texts, next to these two panels. All this in my mind though, in reality, not even one panel is finished yet- yikes! It is a double-edged sword situation, over thinking ends up in slowing my speed but then the end result is more satisfactory in comparison to the other works. And to top it all, I need to visit the Picasso exhibition before it finishes and dear ol’ Munch’s works are being exhibited too… still haven’t caught up with the Invisible show at Hayward Gallery… the SWA show at Mall Galleries… blah… blah… so much to do in so little time. I need a twin, one to finish my works and one to savour all the other beauties of life! Formation, acrylics on canvas, 36″ x 18″. A month of layers, imprints, dots, missing pieces and colours. I think with this canvas I end the discovery paintings and head to the analysing ones- lots of issues to ponder upon, don’t know where to begin. It’s been a year (on 13 June, 2012) since I started treading on this path and I have loved every single moment of it- ups and downs, highs and lows. A piece of good news, I have an exhibition coming up at Radcliffe & Newlands at Liverpool Street. This firm organized an Open Art Competition and my work (How long is so long?) got selected. 🙂 There is a preview on 5 July, 2012 starting 6 pm at 14 Bonhill Street, EC2A 4BX. So, friends and foes (! ), please do come along. Other art news, saw an exhibition curated by Jaishri Abichandani at Rossi & Rossi Gallery in Mayfair. The exhibition titled ‘Stargazing’ showed the works of Anita Dube, Chitra Ganesh, Mithu Sen, Nida Abidi and Jaishri herself- yes, a powerful feminist exhibition. I also got the opportunity to help a little for the installation of Anita Dube’s work so, meeting her and seeing her set up her work was a wonderful experience! Also, meeting the other artists and hearing them talk about their works, their concepts and their journey was inspiring and enriching indeed. So, time to get down to brass tacks and start my work with a new gaze on the newly ordered canvases, all piled up in a corner of the room. Here I come! 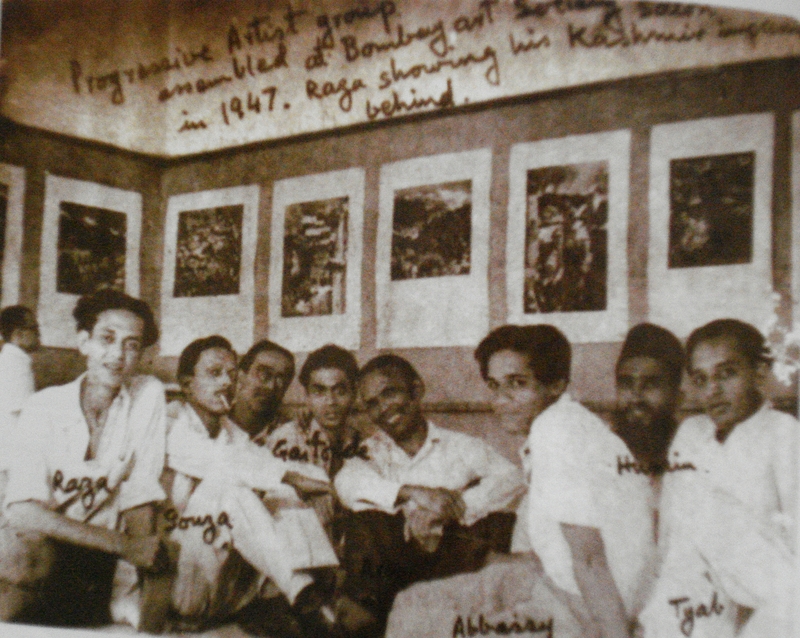 The Bombay Progressive Artists’ Group in 1947. The group was formed by Francis Newton Souza (came across his work at Tate Britain recently) and seen in this photograph are Syed Haider Raza, Tyab Mehta, Vasudeo Gaitonde and my favourite Maqbool Fida Husain. MF Husain, 29 November 1913 – 09 June 2011. I remember seeing Husain’s black and white serigraphs of the Benaras Ghats when I was about 15 years old and being mesmerized by the strong lines. I later came across a copy of the script of ‘Gaja Gamini’ (movie directed by Husain in 2000) through one of my father’s friends and admired the colourful drawings of the ladies in sarees. The script was painted scene by scene! Husain’s huge canvases, the bright reds and yellows… strong, bold and angular lines… so much energy and passion in those strokes. It has been a year since your passing dear Husain, you were and always will be an inspiration! PS: I came across this photograph in the brochure of The Bombay Art Society’s 114th All India Annual Exhibition (2006). There was a small piece written about Husain and he had shared the above photograph. The thought of this exhibition always brings back fond memories because it was my first ever! PPS: Husain’s birth date is given 17 September 1915 on the net but having visited his grave today, the date written on the tombstone is 29 November 1913. Small works and prints of mine being displayed today evening at Kensington. This event is being organized by Becka Hunter and Cat Bee of the Black Canvas Events team. Tickets will be sold on the door and are only £5. All those in London, please do try to make it. 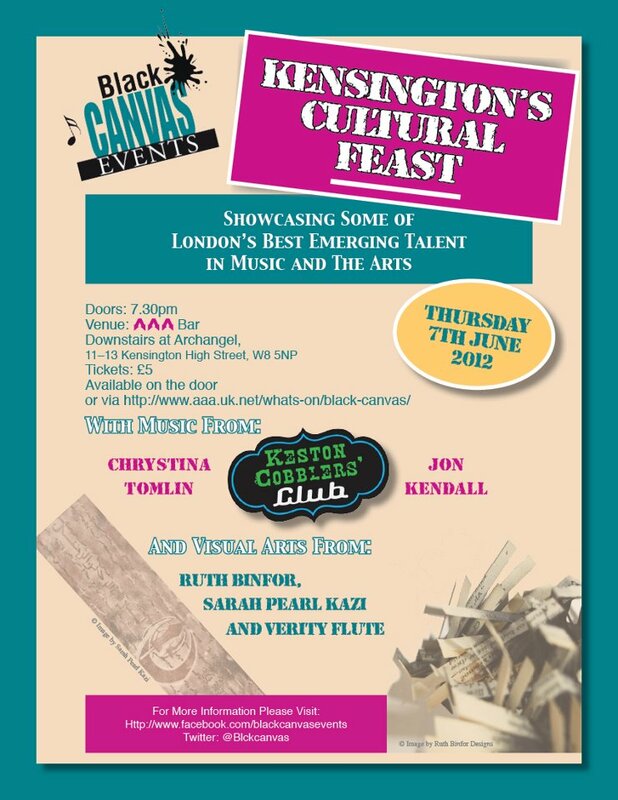 It’s going to be a fun night- some great bands are playing and lovely art works to be seen. Other news on my art front; was informed yesterday that my new work, ‘The ReBirth’ (shown on my previous post) got selected for the Summer Salon Exhibition at the Islington Arts Factory. The exhibition will run from 20 July – 10 August. Shall post details of the exhibition soon. ReBirth, acrylics on canvas, 30″ x 40″. Sigh… finally, finally overcoming an artist’s block! I have been struggling since the last one month… the thing is I know what I want in my mind but the vision just refuses to come up on the canvas. I can leave a work mid-way for a while to start another one but when you are facing the “wall”, you cannot even start a new work. I get up in the mornings with ideas swirling in the head but I just end up staring at the canvas for hours and hours and do nothing at all. For inspiration; visited art shows, met my artist friends, read/reading (finished Taseer, Gabriel García Márquez currently, soon to start the terrific Manto), saw classic Guru Dutt & Muzaffar Ali films but alas, nothing came to my aid! But today, from all the other days, a day so dull, I finally finish my work- I can now relax and start my new works on a positive note. 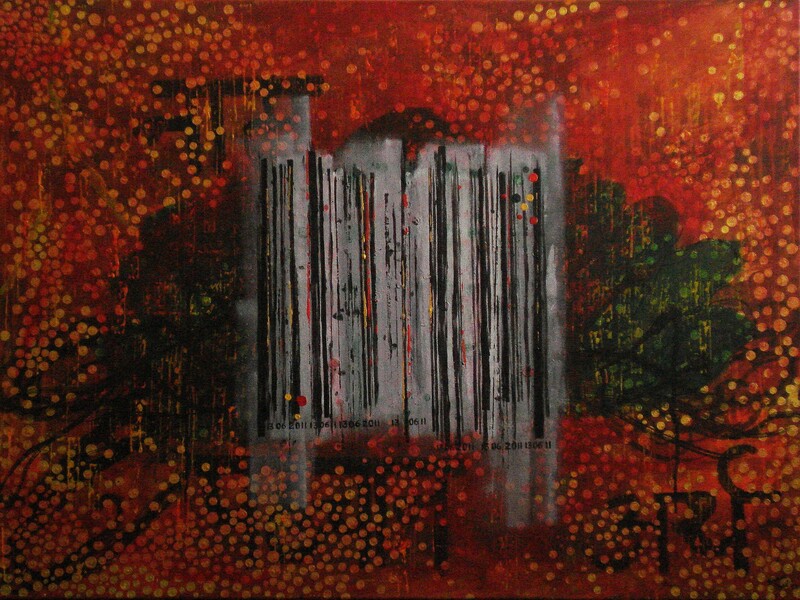 This canvas is very dear to me… it depicts the rebirth of me, my identity- an identity I can finally call my own!